Average insurance rates for a 2008 Ford F-150 are $1,088 a year with full coverage. Comprehensive insurance costs on average $202, collision insurance costs $254, and liability costs around $474. Buying a liability-only policy costs as low as $522 a year, and high-risk insurance costs $2,334 or more. Teenage drivers receive the highest rates at up to $4,288 a year. Rate data is compiled from all 50 U.S. states and averaged for all 2008 Ford F-150 models. Rates are based on a 40-year-old male driver, $500 comprehensive and collision deductibles, and a clean driving record. Remaining premium consists of UM/UIM coverage, Medical/PIP, and policy fees. For a middle-aged driver, prices range range from as low as $522 for a discount liability-only rate to a much higher rate of $2,334 for a high risk driver. These differences demonstrate why anyone shopping for car insurance should compare prices based on a specific location and risk profile, instead of making a decision based on average rates. Companies don’t always publicize every discount very well, so we researched some of the best known and the harder-to-find insurance savings. If you don’t get every credit available, you’re just leaving money on the table. Service Members Pay Less – Being on active duty in the military could be rewarded with lower premiums. Good Student Discount – Getting good grades can get you a discount of up to 25%. The discount lasts up until you turn 25. Life Insurance Discount – Companies who offer life insurance give lower rates if you buy life insurance. Braking Control Discount – Cars that have steering control and anti-lock brakes can avoid accidents and will save you 10% or more. Discount for New Cars – Buying coverage on a new vehicle is cheaper since new cars are generally safer. No Accidents – Drivers with accident-free driving histories can save substantially when compared to accident-prone drivers. Drivers Education – Require your teen driver to successfully complete driver’s ed class if offered at their school. Passive Restraints – Vehicles with factory air bags and/or automatic seat belt systems can qualify for discounts of 20% or more. Bundle and Save – When you have multiple policies with the same insurance company you will save 10% to 20% off each policy. Consumers should know that many deductions do not apply to the entire policy premium. Most only apply to the price of certain insurance coverages like comprehensive or collision. Just because you may think you would end up receiving a 100% discount, you won’t be that lucky. For a list of insurers offering insurance discounts, click this link. When choosing the best auto insurance coverage, there really is not a “best” method to buy coverage. Everyone’s situation is a little different and a cookie cutter policy won’t apply. For instance, these questions may help highlight if you could use an agent’s help. Am I better off with higher deductibles on my 2008 Ford F-150? Is pleasure use cheaper than using my 2008 Ford F-150 to commute? If you’re not sure about those questions but a few of them apply, then you may want to think about talking to an insurance agent. To find lower rates from a local agent, take a second and complete this form or go to this page to view a list of companies. It is quick, free and may give you better protection. Having a good grasp of insurance can be of help when determining which coverages you need and proper limits and deductibles. Policy terminology can be impossible to understand and coverage can change by endorsement. Shown next are typical coverage types available from insurance companies. Your UM/UIM coverage gives you protection from other motorists when they either are underinsured or have no liability coverage at all. It can pay for injuries to you and your family as well as your vehicle’s damage. Since many drivers only purchase the least amount of liability that is required, their limits can quickly be used up. That’s why carrying high Uninsured/Underinsured Motorist coverage is very important. Liability coverage can cover damage or injury you incur to other’s property or people by causing an accident. This coverage protects you against other people’s claims. Liability doesn’t cover your injuries or vehicle damage. Split limit liability has three limits of coverage: bodily injury for each person, bodily injury for the entire accident, and a limit for property damage. As an example, you may have policy limits of 25/50/25 which means a limit of $25,000 per injured person, a per accident bodily injury limit of $50,000, and a limit of $25,000 paid for damaged property. Liability coverage protects against claims like repair bills for other people’s vehicles, legal defense fees and attorney fees. How much liability should you purchase? That is your choice, but it’s cheap coverage so purchase as large an amount as possible. This coverage will pay to fix damage from a wide range of events other than collision. You first must pay your deductible and then insurance will cover the rest of the damage. Comprehensive coverage protects against claims like theft, vandalism, a tree branch falling on your vehicle, fire damage and hitting a bird. The highest amount you’ll receive from a claim is the market value of your vehicle, so if the vehicle’s value is low consider dropping full coverage. This coverage pays for damage to your F-150 from colliding with another car or object. You have to pay a deductible then the remaining damage will be paid by your insurance company. Collision insurance covers claims like sustaining damage from a pot hole, rolling your car, hitting a parking meter, hitting a mailbox and colliding with another moving vehicle. Paying for collision coverage can be pricey, so consider dropping it from vehicles that are 8 years or older. 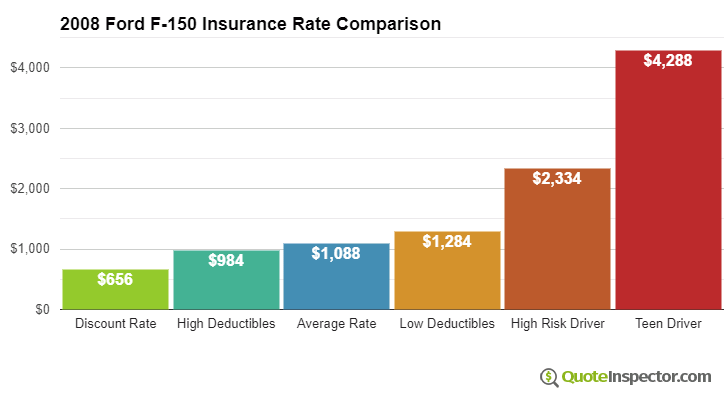 You can also raise the deductible to bring the cost down. As you prepare to switch companies, it’s not a good idea to sacrifice coverage to reduce premiums. There are a lot of situations where someone sacrificed uninsured motorist or liability limits only to discover later that it was a big mistake. Your strategy should be to buy a smart amount of coverage at the best price while not skimping on critical coverages. Throughout this article, we presented a lot of ways to compare 2008 Ford F-150 insurance prices online. It’s most important to understand that the more you quote, the better chance you’ll have of finding lower rates. Drivers may discover the lowest priced insurance coverage comes from a lesser-known regional company. Regional companies may often insure only within specific states and give getter rates as compared to the big name companies such as GEICO and State Farm.